* Muffler shown is not included with the system, only to see how the systme goes together! By routing the primaries up and positioning the catalytic converter more vertical we were able to retain 99% of the primary length of the race system. This is how we are able to achieve 25whp gains on the 991.2 GT3, 30whp gains on the 991.1 GT3 and 32whp on the 991.1GT3RS. 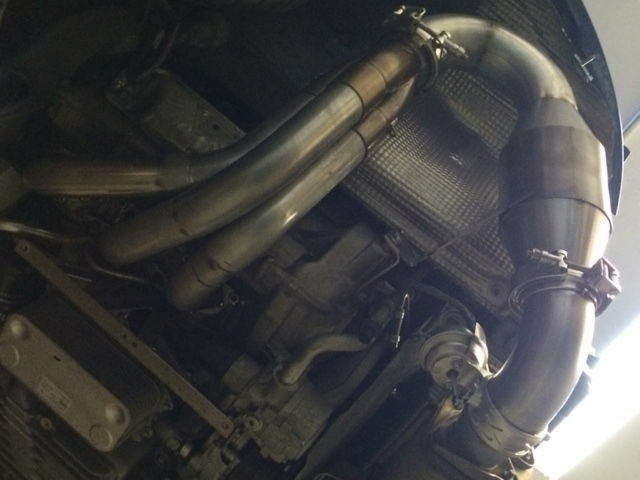 This is the most power from a catted 991.2 GT3, 991.1 GT3 Exhaust, 991.1 GT3RS Exhaust or 911R Exhaust system. 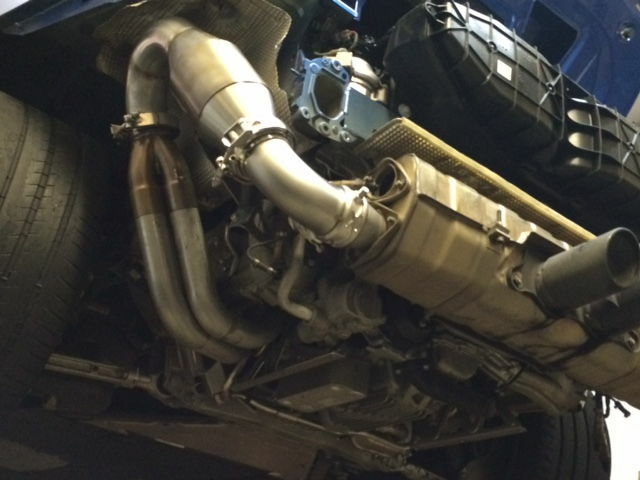 The 991.1 GT3 and RS with the catted system shows it's emissions based camshaft tuning for about 5100-6000rpm area. This stock tuning flattens the power delivery for about 400rpms and then climbs quickly starting at 5400rpm. This is completely fixable with a tune, but understand that many will not want a tune. You get everything you love about the Dundon Race Headers, 321 SS construction, industry leading power, lifetime structural warranty, and 100% money back guarantee, if you try it and don't like it, send it back we'll give you your money back! To that end, see the dyno below! Video from the dyno so you can see and hear the awesomeness! You also get a good shot of how the headers are routed with the wheel off! Great customer service and communication. I love the product and recommend it to anyone and everyone! The car not only gained HP from the system, but it sounds amazing while doing that. Very streetable configuration, cruising without the drone, but when you nail the throttle it wakes right up! Highly recommended. Excellent quality and craftsmanship. I bought the catted system, it sounds wicked, no drone and fits perfect. Sounds incredible throughout the entire rpm range. I can't say enough positive things about this exhaust system. Hands down the best customer service as well. This is the 2nd kit I've bought and wouldn't consider any other at this point. Thanks guys!